Frequently Asked Questions How do I setup a stream delay? 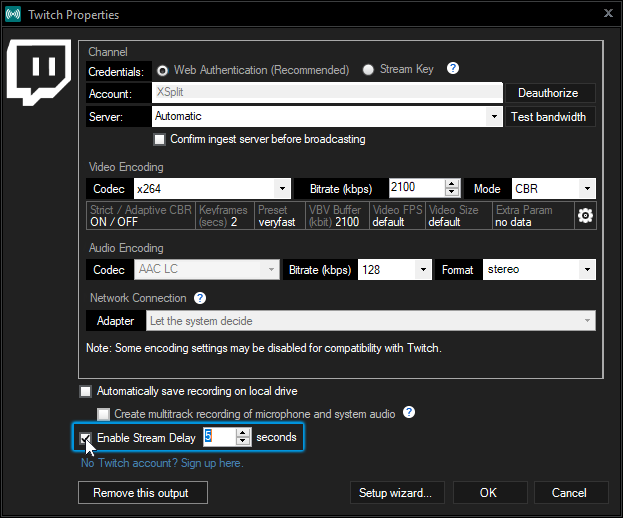 Support > XSplit Broadcaster > Frequently Asked Questions > How do I setup a stream delay? You can setup a stream delay for your streaming Outputs to avoid stream-sniping/ghosting, so opponents couldn't get an unfair advantage over you by viewing your stream. The stream delay set will not determine the exact delay for all your viewers - transcoding, transportation delay, etc. also come into factor.